These exquisite 100% silk neckties feature the famous Austrian artist Gustav Klimt and one of his most notable works, The Kiss. The Kiss was painted by the Austrian symbolist painter between 1907 and 1908, the highpoint of his "Golden Period", when he painted a number of works in a similar gilded style. A perfect square, the canvas depicts a couple embracing, their bodies entwined in elaborate robes decorated in a style influenced by both linear constructs of the contemporary Art Nouveau style and the organic forms of the earlier Arts and Crafts movement. 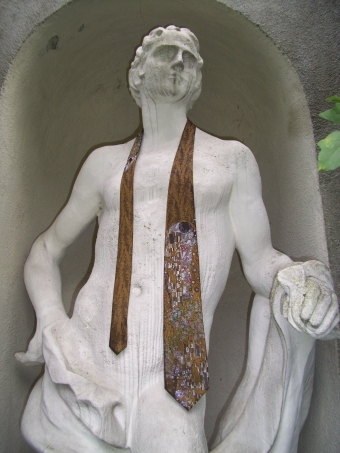 Click the button below to add the Klimt Necktie The Kiss Gold to your wish list.